Liver tends to be a rather polarizing food - either you love it or you find the idea of eating it absolutely appalling. Back in my veg*n days, I would go on and on about how "nasty" liver is, stunned that people would even consider eating it (although I'd never tried it, of course). Once I started eating meat again, I vowed to appreciate the whole animal from snout to tail. After getting comfortable with the basic cuts, I started by buying more unsual cuts of meat and using bones and skin to make stock. Thanks to a trip to France a few years ago, I saw the glory of liver. Not long ago I had my first run-in with tripe and tendon (not bad!). And I've been eyeing up bison blood sausage, duck fat, and leaf lard at the co-op. My journey is slow, but I'm trying, and enjoying every delicious minute. Culinary curiosity beats out hesitancy every time. Hey, if that animal is dying for me, I want to do what I can to ensure that nothing is wasted. To guide me along the way, I am reading The River Cottage Meat Book by Hugh Fearnley-Whittingstall and Charcuterie by Michael Ruhlman and Thomas Keller. I read cookbooks like novels, and these books are genius. I am finding the subject matter absolutely fascinating, and love learning about where each cut of meat comes from and how the organs and other animal parts can be used. Somehow, this book has made me excited about the prospect of making gluten-free kidney pie and finding an opportunity to butcher a chicken myself. As Anthony Bourdain would say, bring on the "nasty bits"! Where did that veg*n girl go? Whoa. If you're looking for a really easy way to break away from the world of skinless boneless chicken breasts, this paté is an easy way to start. This paté is rich and flavorful, highlighted with fresh herbs and lemon. It is sure to please even someone suspicious of liver! 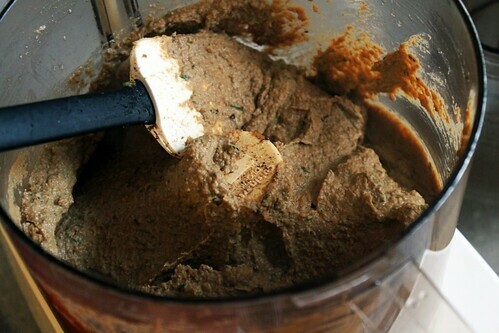 Paté is a delicious, affordable, nutrient dense solution for snacks and meals. Besides being delicious, it is a sensible spreadable protein alternative to hummus or nut or seed butter, making it perfect for individuals who can't tolerate beans, nuts, or seeds. Liver is an incredibly nutrient dense food. It is an excellent source vitamin A, vitamin B12, iron, riboflavin, selenium. Additionally, liver is a good source of DHA, EPA, and AA, fatty acids that are essential for the body. Liver is also very high in protein - 1 oz of cooked chicken liver contains a whopping 7 grams of protein, but only about 40 calories. Considering that liver is fairly inexpensive (one pound of organic chicken liver was only $3.59/lb), it provides incredible nutrition per dollar. And while it is undeniably high in cholesterol, a serving of paté here and there shouldn't be a problem for you if you are eating a clean diet free of all those nasty cholesterol sources. One caveat: make sure to get organic liver from animals that are free of antibiotics and hormones. Think about it. The liver is basically a filter, right? Animals that are exposed to chemicals will have a higher toxic load, and therefore, that little liver is going to be full of chemical residues. You eat that, and it adds to your own body's toxic load. Not good! If you buy organic liver you will save yourself from eating all those toxins. Also, make sure the livers are fresh as possible. If you don't see them in your butcher case, just ask - they might be able to special order them for you! Wondering how to eat paté? In my opinion, nothing is better with paté than a smear of mustard and slices of pickle. It is wonderful as a dip for raw vegetables, like carrots and radishes. You may choose to spread it on a lovely slice of Pumpkinseed Teff Sandwich Bread or Buckwheat Sesame Crackerbread. For a grain-free treat, you could make make these delicious little Cucumber, Radish, and Paté Sliders - thin slices of radish and cucumber layered with paté, and topped with mustard. Or, do like my coworkers did, and it is plain off a spoon. Any way you eat it, it will be delish. Want another tasty paté recipe? 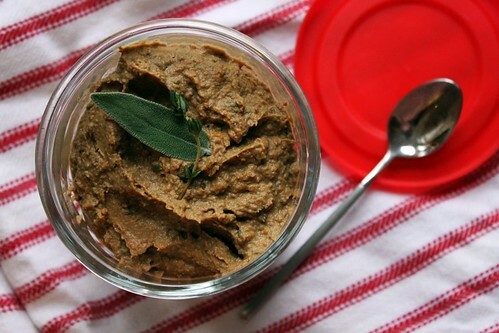 Try my Tuscan Chicken Liver Paté. Oh! And one more thing. I hosted the first gathering of the MPLS Swappers last weekend, a Minneapolis-based food swap dedicated to the exchange of home-produced, homegrown, and foraged foods. A writer from The Heavy Table covered the event, and wrote a great article about it. Check it out! This paté is rich and flavorful, highlighted with fresh herbs and lemon. It is sure to please even someone suspicious of liver! Serve as an appetizer or eat as a light main course with breads, crackers, or vegetables. Make sure to get very fresh organic chicken livers; non-organic chicken livers may have highly concentrated amounts of chemical residues. A good butcher should be able to order them for you if they are not always available in the meat case. Trim any sinews from the livers and dry well with paper towels. 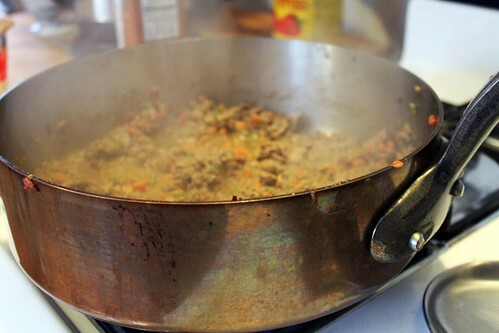 In a large skillet, melt the ghee and olive oil over medium heat. Sauté the leek, garlic, carrot, celery, anchovy, nutmeg, and ginger until lightly veggies are lightly browned, 6 minutes or so. Add chicken livers and cook over high heat until browned, then add half of the broth and keep stirring with a wooden spoon, breaking up the livers as they start to cook through. When the broth is absorbed, add the remaining broth and the minced fresh herbs, and cook until liquid is absorbed and livers are fully cooked and broken up. Remove from heat and transfer to a food processor. 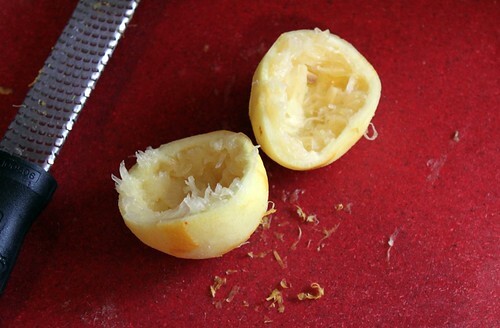 Process until quite smooth, then add lemon juice and zest and salt/pepper to taste, and process to combine. Serve warm or at room temperature. Spread on breads, crackers, collard wraps, or vegetables. Is delicious scooped up in Belgian Endive spears!